All the jewellery pieces made by Stampede Accessories are handcrafted employing the technique of hand stamping. Hand stamping is a process of “stamping by hand” using steel stamps and a hammer. Each stamp is applied one at a time by a hammer which is used to impress the letter into the metal. The character depth will depend on the level of impact applied by the hammer. Accordingly, there may be variations in character depth given the human interaction involved. Similarly, there can be variations in the spacing as each of the stamps are aligned by eye, with the artist having a discretion of the spacing to be applied between each character during the design process. Hand stamped jewellery has a rustic finish that cannot be achieved by traditional machine engraved jewellery. With machinery, it is easy to obtain a neat, “perfect” finish with consistent indentation and even spacing, without the requirement of a personal artisan touch. Each method has a different finish and style which will appeal to different people. It is this personal touch and ingenuity which will attract you to Stampede Accessories. Stampede Accessories is a boutique studio located in Barmera, South Australia. Kelly Porter, founder, understands that each piece is sentimental and will be a keepsake for future generations. Accordingly, Stampede Accessories uses only quality metals and takes the utmost care with each personalised piece to ensure a high standard of workmanship. 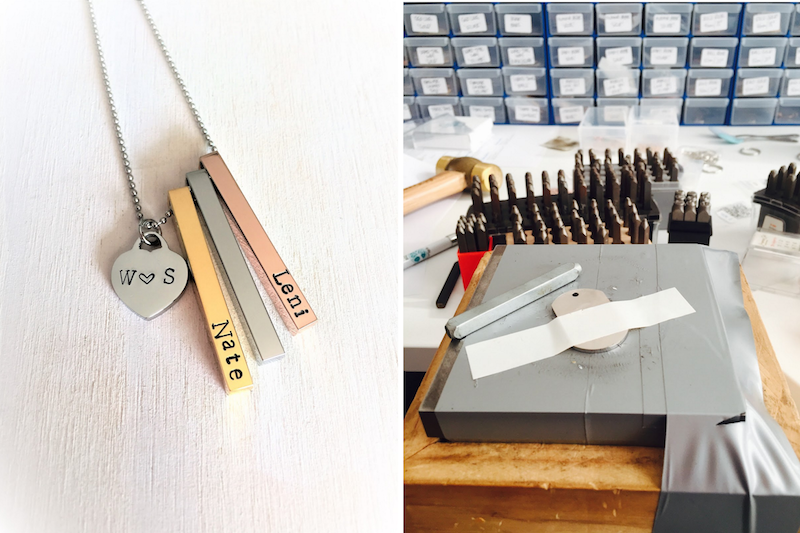 “What I love about handstamped jewellery is hearing the stories behind the pieces. My customers share those special life moments that have inspired their keepsake and I learn the significance of what that jewellery piece means to them and it becomes more than just a sale. Often our jewellery pieces are gifts and we get to be a small part of another special moment”. Got a special occasion coming up? Looking for a unique gift? Browse the Stampede Accessories website to view the wide range of personalised jewellery and accessories or feel free to contact Kelly to discuss.